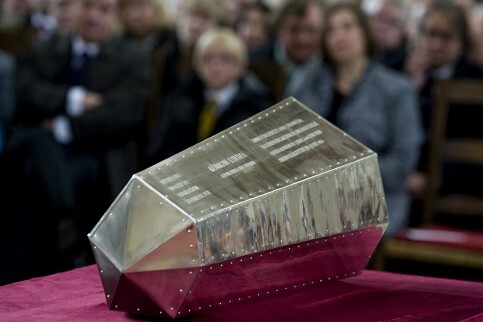 The History Blog » Blog Archive » Queen Eadgyth laid to rest. Again. Queen Eadgyth laid to rest. Again. The remains of Queen Eadgyth, granddaughter of Alfred the Great and wife of Holy Roman Emperor Otto I, were reburied in an ecumenical ceremony in Magdeburg Cathedral this Friday. Her bones were found in a lead coffin inside a stone sarcophagus by archaeologists doing some work on the cathedral in 2008. Even though there was a cenotaph dedicated to her in the church, the find was unexpected because her remains were known to have been moved several times. The burial wasn’t original. 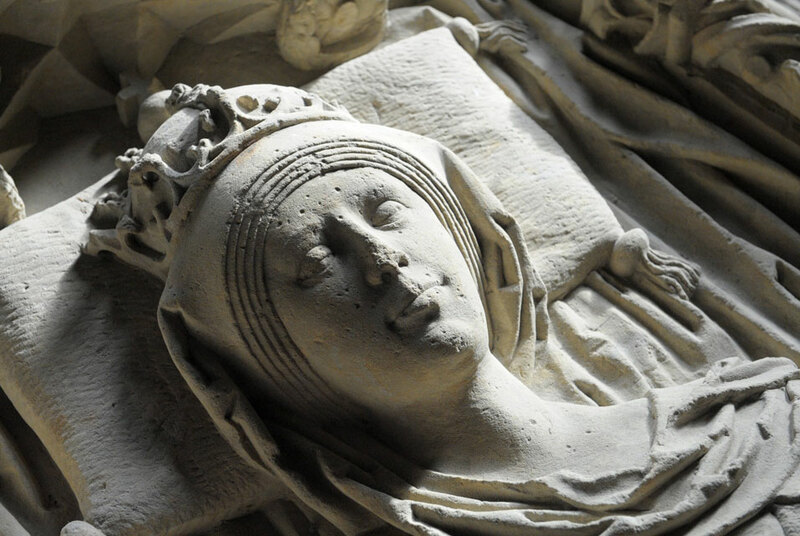 She died in 946 A.D, and an inscription on the lead coffin noted her name and the reburial date (1510), but of course that wasn’t sufficient to prove that the bones belonged to the queen herself. It wasn’t until this year that isotope analysis on her teeth confirmed that the remains did indeed belong to Queen Eadgyth. Now that the science has been done, the good Queen has been put to her final rest. Again. Hundreds gathered in the 800-year-old Magdeburg Cathedral to pay their respects. First there was an ecumenical 2-hour funerary service with both Lutheran and Catholic clerics presiding, then a closed coffin viewing of Queen Eadgyth’s remains. After that, the coffin was placed inside the stone sarcophagus and reburied under the floor of the cathedral. The coffin is so small because there are actually not that many bones left, only 40 out of the usual 200, and some fragments of her skull. Otto had given the city of Magdeburg to Eadgyth as a wedding present. She was widely beloved and known for her charitable works and kindness. She was never canonized, but she was revered locally as a saint for centuries, hence the missing bones. Whenever she got moved, people helped themselves to pieces of her as relics. This entry was posted on Sunday, October 24th, 2010 at 9:45 PM	and is filed under Medieval, Modern(ish), Treasures. You can follow any responses to this entry through the RSS 2.0 feed. You can skip to the end and leave a response. Pinging is currently not allowed. Seems to be an interesting back story about the ecumenical service. The Queen of course would have been Catholic. Her husband Otto built the original church as part of a failed attempt at enlarging his domains (and Christendom). Both were buried there, then reburied in the current building after the original burned down. While they ‘slept’ Magdeburg became a hotbed of the Reformation and the cathedral is now the center of the (Lutheran) ‘Evangelical Church in Central Germany.’ So the deceased is Catholic but the church is Protestant and both faiths were represented. Also, don’t like the looks of the coffin. Looks like they’re planning to shoot her into space. It does look a little on the space probe side, no denying. Well, of course, Eadgyth died before the Great Schism of 1054, so it could also be argued that she was Orthodox rather than Catholic. I have seen many Orthodox sites laying claim to e.g. English saints from before the Schism. Do they claim them as specifically Orthodox saints or do they just consider all pre-schism saints as Orthodox because everyone was “Orthodox” before the schism? For one week the Oxford Dictionary of National Biography is showing online its biography of King Athelstan, Eadgyth’s brother. Damn, I missed it. Thank you for the link, though. I can tell I’m going to be spending absurd amounts of time on that site.